Have you seen the featured APOD image before? Maybe. And that's my final answer. Just curious, Photo was posted Apr 24th, and poll was closed a bit after 8PM on Apr 23rd. This tells me you must have Time-Travelers in your viewing group as I find this combination impossible to cast my vote. Anyway, Yes I have seen it many times, in Magazines, books, Hubble site, APoD, etc. It never fails to generate awe. Saw it before and was shocked to see that the 7th-day Advantagists were using it in their magazine and claiming ownership of the nebula and the whole universe for their deity. The poll end time has been reset; you should be able to vote now. Apologies for the error! I've seen it *loads* of times! ... I've never liked the colors. More seriously, it is a bit of a marvel but it's hardly the only star-forming region out there. I started to feel overexposed to this particular image years ago, before I even knew APotD existed. Now I think of it, APotD has balanced things up for me, by not featuring it too often. For a while, possibly in the early 2000s, that image popped up so often in popular media that I felt as if it was more an advert for the Hubble itself and all pre-Hubble images were forgotten. I wish someone would get the Hubble to shoot those three missing tiles in the upper right. It bothers me every time i don't see them. robcat2075 wrote: I wish someone would get the Hubble to shoot those three missing tiles in the upper right. Yes, most of us have seen it before. But your text and links in the caption are always welcome! They serve as great reminders of the astronomical understanding, and, unlike the *rest of the entire internet* - they are trustworthy! Keep up the good work! When it was released, I remember thinking it was a desperate bid to get past the embarrassing disaster. And brilliantly done: no one remembers now that Hubble was a worthless heap of scrap not long before this picture was taken. Yes..and my heart still flips over at the sight! Thanks yet again! I'm fairly certain I've seen images of those clouds that look very similar to this one but whether they were the same picture or not is not something I would be sure of. I have, for example, seen a nebula looking very like that one as a display on the wall of "Voyager's" conference room. Janeway seemed very fond of it. eekee wrote: I've seen it *loads* of times! ... I've never liked the colors. Photoshop. Irfanview. GIMP. Change the RGB values to something you like better. 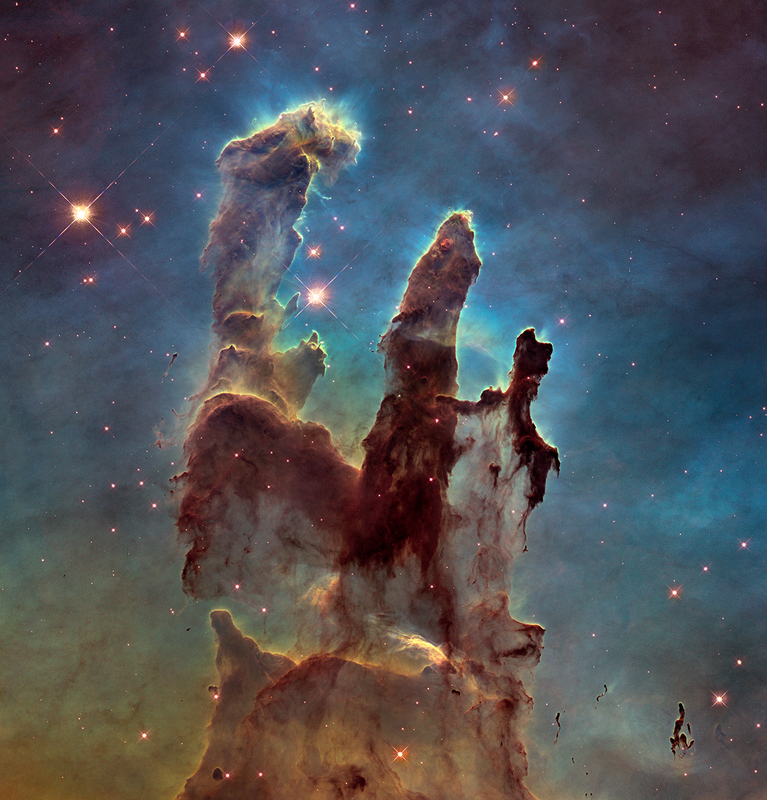 The image of the Eagle nebula was used as part of the set in Star Trek: Voyager. It was used as a backdrop, located in the "Astrometrics Lab" where Seven of Nine used to hang out. I'm sort of embarrassed that I remember that. The image of the Eagle nebula was used on the TV show "Star Trek: Voyager". It was used as a backdrop in the "Astrometrics Lab" where Seven of Nine used to do whatever it was she did. I'm sort of embarrassed I know that. Air4ce wrote: The image of the Eagle nebula was used on the TV show "Star Trek: Voyager". It was used as a backdrop in the "Astrometrics Lab" where Seven of Nine used to do whatever it was she did. They always had a bunch of Hubble images in there. It was fun to try to identify them. Yes, this is an iconic image. But since new science can be found in older images using new techniques, this image can still be relevant and informative. Yes, but I don't mind as long as there is something new to be discussed. Yes I have seen it, but that doesn't mean I don't want to see it again! Fabulous! Why do we keep using the one with missing pieces? Ive seen it on APOD enough times I can recognize it. But it's always beautiful and amazing. How about a link to a golden oldies gallery? triker wrote: How about a link to a golden oldies gallery? Saw it on a greeting card. It is good to refresh what it is. Thanks for repeated postings inspiring deepening wonder and awe. It's a great picture, but I have seen it several times before. My preference would be for APOD to post unique pictures every day. There are enough cool and inspiring options that I don't think there is any danger of running out of material.